Despite the exaggerated news of the untimely 'death of the detail' by Greg Lynn, the architectural detail is now more lifelike and active than ever before. In this era of digital design and production technologies, new materials, parametrics, building information modeling (BIM), augmented realities and the nano-bio-information-computation consilience, the detail is now an increasingly vital force in architecture. Though such digitally designed and produced details are diminishing in size to the molecular and nano levels, they are increasingly becoming more complex, multi-functional, high performance and self-replicating. Far from being a non-essential and final finish, this new type of highly evolved high-tech detail is rapidly becoming the indispensable and critical core, the (sometimes iconic) DNA of an innovative new species of built environmental form that is spawning in scale and prominence, across product, interior, urban and landscape design. 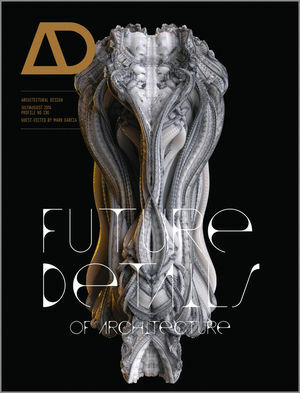 This issue of AD re-examines the history, theories and design of the world’s most significant spatial details, and explores their innovative potentials and possibilities for the future of architecture. Mark Garcia is a consultant, researcher and academic. He is currently a lecturer, teaching Unit 4, the architectural design studio in the School of Architecture, Design and Construction at the University of Greenwich in London. He has held academic teaching and management posts at St. Antony's College (Oxford University) and in the Departments of Architecture and Industrial Design Engineering at the Royal College of Art (RCA), where he supervised M.A, MPhil and PhD students. He has worked in industry as a manager for Skidmore Owings and Merrill (SOM) and Branson Coates Architecture (BCA). Mark has authored and edited a number of publications including Architextiles, AD (Wiley, 2006), Patterns of Architecture, AD (Wiley, 2010) and The Diagrams of Architecture, AD Reader (Wiley, 2010).